Diabetic retinopathy correlates best with duration of diabetes and overall glycaemic control. In this study, we examined (i) change in the likelihood of retinopathy (a measure of glycaemic exposure) and (ii) presence of retinopathy at the time of diabetes diagnosis (a measure of delay in diabetes diagnosis). Seven ethnic groups with T2DM attending our Diabetes Centre were studied for the periods before and after year 2000. Using our database, the relationship between retinopathy prevalence and known diabetes duration at the initial visit was examined by weighted linear regression for Anglo-Celtic (3684), Mediterranean (2342), Arabic (511), Chinese (1180), Indian (500), Australian Aborigines (350) and Pacific Islander (249) patients. The slope of the regression is used to calculate the propensity to develop retinopathy per unit time. 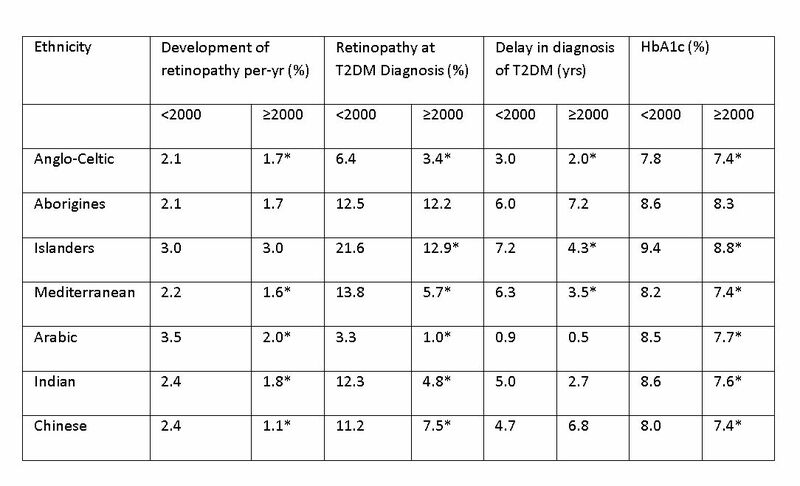 By extrapolating back to a time of zero retinopathy, the presence of retinopathy at the time of known diabetes diagnosis (y intercept) and the delay in the time of diabetes diagnosis (x intercept) can be estimated. Retinopathy was detected by ophthalmoscopy or photography. HbA1c improved in all ethnic groups but not in the Aborigines. BP and cholesterol improved in all ethnic groups. Every ethnic group studied showed a statistically significant decline in the rate of developing diabetic retinopathy, except for the Aboriginal and Pacific Islanders groups. As glycaemic control is the major determinant of diabetic retinopathy at any diabetes duration, any improvement observed is likely to be due to better glycaemic control. This is supported by our observation of less HbA1c improvement and higher final HbA1c in the Aborigines and Islander patients. The Aboriginal group also showed no reduction in the delay of diabetes diagnosis. It is likely that lifestyle and socio-economic changes required to achieve better glycaemic control and timely medical consultations are more difficult to achieve in these groups.